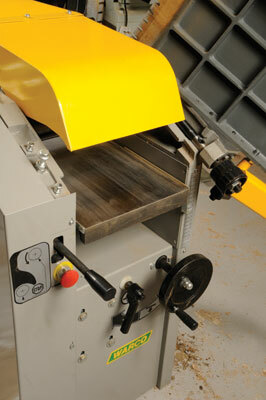 The first impression is of a compact no-nonsense machine. While the tables were not in the same plane as each other on the machine as delivered and the take-off table was higher on the right-hand side than the feed table, levelling screws allowed me easily to adjust the tables for truth. I wanted to find out whether the engineering stable of Warco had produced a serviceable machine with the user-maintenance capabilities that are usually found on more expensive machines. The fence was easily adjusted for square, but the action of removing and refitting the fence to swing the tables up for thicknessing allowed a possibility of knocking the very solid fence support bar against the cutter block or knives; however, the system worked well and there were no problems. The bridge guard pivot is tightened by a Bristol lever which allows the guard to be fully swung out of the way - a point that I like; guards that cannot be moved out of the way as you adjust the machine are a real nuisance; of course they should be robustly in place when needed as well. With the tables adjusted, the knife projection checked and the fence and guards in position I was able to surface some timber. Face and edge were quickly produced on a stick of mahogany ready for thicknessing. Both tables lift up and the chip collector is swung over. The extraction port is for 4in hose. 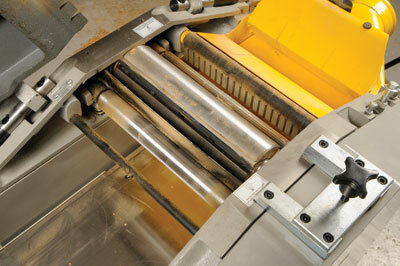 Feed rollers, the front one metal ribbed, are engaged by a lever and are single speed only. 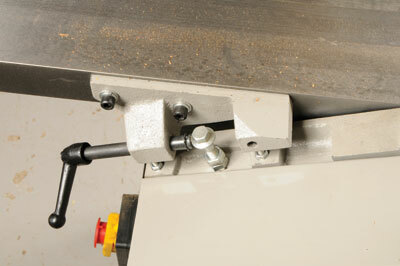 The thicknesser table is supported by a single column and operated by a handwheel. All these controls work smoothly. 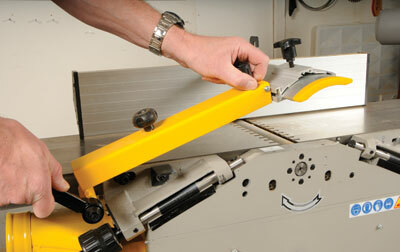 A column lock and an emergency stop button face the operator when thicknessing. Some marking from the ribbed roller was removed by a couple of clean-up passes. Noise levels were surprisingly low. 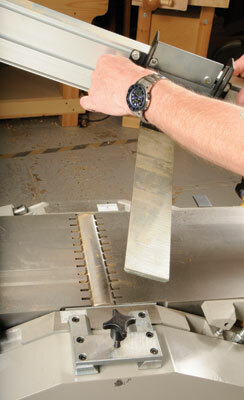 Surface finish was good and a square parallel-sided stick of timber was produced. Even when locked there was a small amount of 'give' in the thicknesser table. Although this did not cause a problem it surprised me as I haven't seen thicknessed timber vibrating in its length in the same way on other thicknessers. It was sight of this visible vibration that caused me to check the table for give. I like this little machine because of its obvious and easy adjustment mechanism, but because it is so Spartan I would need to have one on a long-term test before I could recommend it unreservedly. 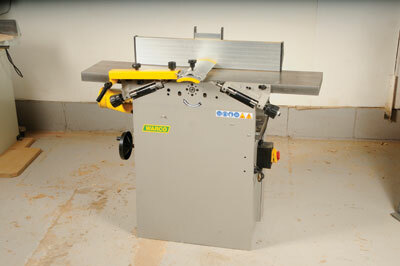 I would certainly prefer it to my existing planer because of its smaller footprint and lower price. 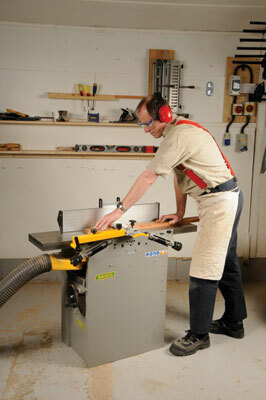 "I would certainly prefer it to my existing planer"